The law of the Lord is perfect, reviving the soul; the decrees of the Lord are sure, making wise the simple; the precepts of the Lord are right, rejoicing the heart; the commandment of the Lord is clear, enlightening the eyes; the fear of the Lord is pure, enduring forever; the ordinances of the Lord are true and righteous altogether. More to be desired are they than gold, even much fine gold; sweeter also than honey, and drippings of the honeycomb. Moreover by them is your servant warned; in keeping them there is great reward. But who can detect their errors? Clear me from hidden faults. Keep back your servant also from the insolent; do not let them have dominion over me. Then I shall be blameless, and innocent of great transgressions. 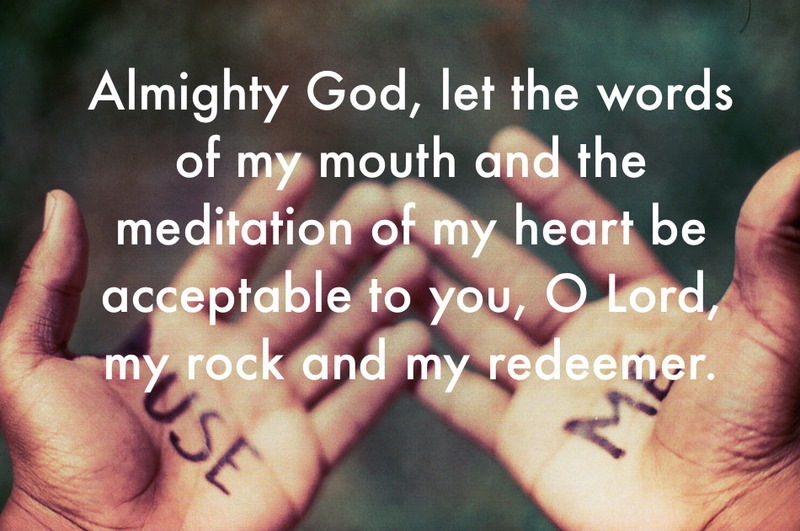 Let the words of my mouth and the meditation of my heart be acceptable to you, O Lord, my rock and my redeemer. There were two men. The first lived his life perfectly and blamelessly; everything was coordinated and examined. He never wasted a moment and did his utmost to plan for every contingency and minor catastrophe. If he could live his life in consistent repetition, he believed he could achieve perfection. Every morning he awoke to eat the same breakfast and spend precisely 15 minutes reading from his bible, offering up the same lifeless prayer. He wasn’t sure that he actually believed in God, but he wanted to be safe. He took the same roads to work, ordered the same lunch, used the same pencil brand. Everything was accounted for. He made his money, invested in the right companies, provided for his family. On the surface he had everything you could want. Except he did not have life. The second man lived a life of apparent chaos as he tried desperately to cling to something solid as the world continued to spin around him. Every morning was a new and exciting, though sometimes terrifying, adventure. He would often oversleep leading him to rush off to work without his breakfast or morning coffee. He was a faithful Christian, he somehow was able to make it to church every week, his bible was often found in different places throughout his house with ear marks and underlined passages in the Old and New Testament. He believed deeply that God was a living and loving presence in his life and looked forward to his moments of silence during the day when he felt he could best commune with the divine. Speaking with God was not about rhythm or repetition, but a life-giving and humbling experience. He made his money, tried to invest, but believed that spending time with his family would be more rewarding than a large portfolio. On the surface he was missing some of the things that make up the American dream. But he had life. 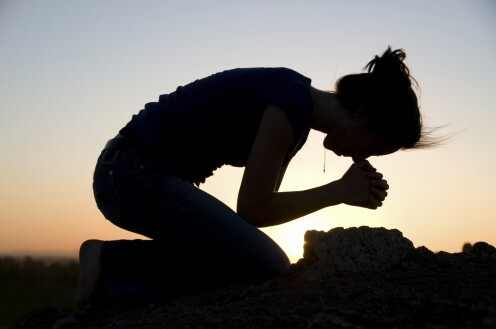 It has taken me a long time to learn how to pray; and I’m still not satisfied with my prayer life. I go through waves of devoting time everyday to sitting in silence and talking with God, and then there are days when I have realized that I felt too busy to pray. I have spent weeks praying prayers that have been written in books, and I have spent months praying extemporaneous prayers from my heart and soul. I have experimented with numerous spiritual disciplines, and I’m not sure that I have found the one that is just for me, perhaps I never will. Prayer is one of those things in the life of Christian discipleship that we expect, but rarely talk about. Whenever we get together as a church, before an activity begins, all eyes fall on me to lead us in prayer so that we can start. Sometimes those prayers feel life-giving, but oftentimes they feel like an expectation. When I am asked to pray before a meal, there are times that I feel truly genuine in expressing my thankfulness to the Lord, but there are also times when I feel that I am just going through the motions. There was a long period in my life where I felt like the first man. I would wake up early and ride my bike to Duke Divinity School just so that I could be there for Morning Prayer with the Anglicans and Episcopalians. I even started to lead the daily worship service. But there was a time when in meant very little to me. It became so routine that I stopped listening to the words, and felt that it was more important for me to be there in body, than it was for me to be there in heart and soul. Last week I asked us to examine a simple, yet profound, question: What is the point of Church? Why do we spend time each week gathering in this place? I attempted to proclaim God’s Word in such a way that we could begin to move away from a maintenance model of Church, to a missional model where we live as Christ’s body for the world. Today I would like to ask an equally simple, yet profound, question: Why do we pray and read scripture? Why do we take the time to halt the busyness of our lives to read God’s Word and commune with him? The psalmist writes that the law of the Lord is perfect, it revives the soul, it makes us wise, it allows us to rejoice in our hearts. The commandments are clear, they open our eyes. The fear of the Lord is pure and endures forever. The ordinances of the Almighty are true and righteous. The psalmist even goes on to claim that the Word of the Lord is to be desired more than gold and sweeter than honey. You could give me a biscuit with honey on it right now, and I would tell you that is the sweetest thing in the world. Yet, as I have grown older, as I have spent more time deep in God’s Word, its sweetness has been revealed to me. In a conversation with someone during bible study, or deep in prayer about someone’s life and suffering, a new vision and understanding is presented to me out of God’s Word. It truly is a sweet gift, one that speaks to us, even today, from God. The difference between the two men, is that the first saw his responsibility to prayer and scripture as simply that – a responsibility. He sets aside the time to read and pray, but the words on paper and the words on his lips are lifeless. He believes the first part of the psalm but expects that so long as he maintains his regular practice it will be enough. The second man, however, recognizes that he can do more, that speaking with God can be different and casual and faithful. Psalm 19 begins to answer our question: Why do we pray and read scripture? It refreshes our souls. When we spend time reflecting on God’s Word and going to him with our thoughts, desires, hopes, and fears we honor the living Lord who refreshes our souls for a new day. It simplifies the way we envision the world, and reminds us who we are following and why. It humbles us and rewards us. However, even with the benefits and warnings in scripture, we cannot completely avoid hidden sins and mistakes nor can we control others around us and prevent them from doing the same. God’s Word operates as a warning about the transgressions of life. It has not only the green light of “allowed”, and the red light of “forbidden,” but also the yellow light of “caution.” Ordinary and humble people do not normally go plowing through the red lights of life. Deliberate and precise sins come with practice and committed degeneracy. But we are all constantly taking chances with the yellow lights of behavior. That is why the end of the psalm is so important: Who can detect all of their own errors? Who can look at their life and faithfully say I was wrong? Great God, cleanse me from my hidden faults, keep me from those who would do harm to my soul. The greatest test of our faith is found in our willingness to seek forgiveness from our sins, particularly those no one knows about except us. When we have committed a wrong against someone, and everyone else knows about it, I believe we are more inclined to seek forgiveness. But when we do something wrong in secret, when we sin while no one is watching, I believe we are less inclined to ask for forgiveness, because it is entirely on us. God’s word and a life of prayer are therefore the ways by which we might have the strength to admit our faults, as we read about so many who have sinned before us, and seek forgiveness as we commune with the Lord in prayer. 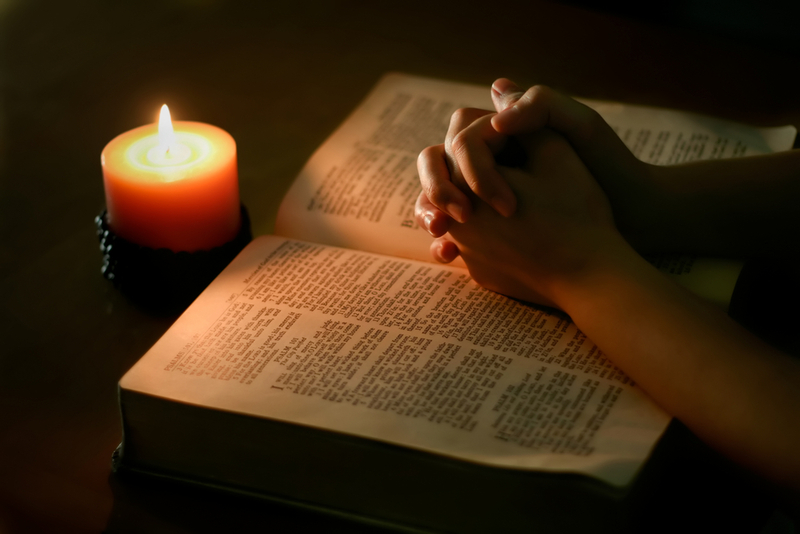 Reading and praying are as essential for us as are eating and breathing – they all give us life. If you want to become a United Methodist Pastor, there are a number of requirements you have to meet. One of the most stressful is planning a full worship service, leading it, preaching, and having the entire thing videotaped. I was still in seminary when I asked my home church if I could “take over” for one Sunday in order to film the service and send it off to the people who would determine whether I should become a pastor or not. I fretted about the service, overanalyzed the bulletin, worried about the hymns I selected, stressed about the scripture, and never felt the sermon was good enough. After all the weeks of planning and communication I showed up at my home church Sunday morning, and prepared to put it all on the line. I remember standing in the back, and giving my father the “thumbs up” to start recording when Jason, my friend and pastor, walked ahead of me to address the congregation. The service was oriented around a reading from the end of James about sharing our sufferings with one another. The role of disciples in the church is to rejoice with one another at times of happiness, and weep together during times of sorrow. We are called to love one another through the good times and the bad, but we can only begin to find healing and reconciliation if we share our struggles. I made my way out of the sanctuary proud of the service and hopeful that it was good enough for the Board that would be viewing it. But while my mind was caught up in my own selfish reflections about the service, I saw a member of the church, someone I knew very well, crying in her pew. She shared with me that her daughter had been suffering with bulimia through the last six months and she had refused to share it with anyone. She was embarrassed that she had failed as a mother and she felt as if she was carrying the whole world on her shoulders. She said that after hearing the scripture read, and the words of the sermon, she prayed in her pew, and she realized (for the first time) that the church was the place that she could share her burden. And while others were preparing to leave she reached out to the stranger in her pew and asked if she could share with him her struggles and pray together. With tears flowing down her face she said that this was the best she had felt in months. The Word of the Lord is greater than gold and sweeter than honey. In the moments of our reading and praying we are opened up to the strange new world of the bible and of faithful living that can change everything. We pray and read to cleanse our souls and to give us life. It is not something that has to be strictly observed with militaristic expression, but instead something that we believe can change our lives. The final line of the Psalm 19 is a beloved and permanent aspect of worship; they are the words I pray before preaching every single Sunday. If our words and thoughts are acceptable in the Lord’s sight we are on the path toward renewed spirits and discipled living. When those words become our truest prayer and hope then we are speaking and thinking as if Jesus was at our elbow which, after all, is the whole point of prayer. This entry was posted in Old Testament and tagged Commune, faith, God, Hope, Jesus, Life, Old Testament, Pray, Prayer, Preaching, Psalm, Read, Scripture, Sermon. Bookmark the permalink.